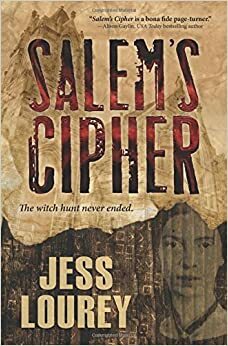 Jess Lourey’s latest novel, SALEM’S CIPHER, has something to draw in most every reader: mind-bending ciphers that must to be solved, strong protagonists, and truly evil antagonists. I loved this book and I think everyone else will enjoy it just as much as I did, too. For centuries, the Hermitage Foundation has been working in political backrooms and business boardrooms to take over the world. The Foundation currently exists as a lobbying firm that has their hands in the pockets of very powerful American politicians, and it views women as the greatest threat to its power. The Underground, another centuries old organization, was founded to protect women and make sure the Foundation does not rise to power. Minneapolis cryptologist Salem Wiley and her best friend since childhood, Isabel Odegaard, get pulled into this generations-old battle after their mothers, Vida and Grace, are kidnapped by the Foundation. In order to save their mothers, Salem must solve cryptic puzzles that have been hidden across the country before the Foundation can take over the world. Some of the puzzles were created by novelist Emily Dickenson and have been unsolved for hundreds of years. As I’ve said before, I’ve been a fan of Jess Lourey’s writing since her 2006 debut novel, MAY DAY. Her writing has matured as her Murder by Month series of books progressed; however, SALEM’S CIPHER, shows that she has taken her writing to an entirely different level. There are several concurrent plot lines – Salem and Isabel tracking down their mothers, a female senator running for president, the Foundation plotting to stop her from becoming president, as well as flash backs to Salem’s childhood – that Lourey masterfully winds together. The fast paced thriller makes the reader want to continue turning the pages of the book to find out how everything intersects. The challenging puzzles, the fascinating history lessons, and the strong characters make SALEM’S CIPHER one of my favorite reads of 2016.